While I was spring cleaning my room the other day, I opened the cupboard which holds my yarn stash. No, I had no intention of spring cleaning this part of my room – I only planned to pet the yarn and keep it back. And as I was doing this, I realized I was wearing an acrylic hand-knit top, made ages ago. And the irony was evident – I was living in mediocre quality yarn (I love acrylic, would never call it inferior) while my softest yarn was locked away in a cupboard, wasting away. That was the time I decided to knit up some of my good yarn and actually wear them. This FO is the first outcome of that decision. Knit Picks Shine Sport is one of the initial yarn purchases I made. I planned to knit this up into a tee or a shawl, but had kept it stashed away in a corner. Searched on Rav for FOs which people have made using this yarn and Purl Soho’s Cap Sleeve Lattice Top caught my attention. Pattern is free (unplanned bonus!) and a quick glance through it strengthened my resolve. A voice in my head kept repeating “bottom up knitting”, but I ignored it. A quick swatch confirmed that the yarn and pattern are suitable for each other and thus I cast on. The never ending, mindless stockinette was both a boon and a bane. I loved the mindless knitting when I had to attend work related calls and I could knit away to glory without spending any brain cells on this. At times, the monotonous work got me so bored that I would shove it away for days together. The longer I knit, the longer it felt it would take for me to finish this. I also suspected some negative elves sneaking into my room at night and unraveling all my knitting. How can the tee not be done already!!?? One fine night (after a pulled an all nighter to get this darn thing over with), I was finally done with stockinette section. Compared to this, the lace section was a breeze. I was done in no time. Thanks to my yarn choice, the lace portion was too long compared to the body, so I had to do some quick fixing there. I folded the extra fabric under the sleeve and stitched it in place. This does not show on the RS at all, so I am all good. Remember the voice which kept saying “bottom up”? It became stronger when I realized the tee is too long than intended. It was a good 3″ long – have no idea how. End of every day, before I hung up my knitting, I would try the top and ensure it wasn’t longer than I wanted and yet, I ended up with 3 extra inches. Yes, my dear voice, “bottom up” issue it is. If it was top down, it was as easy as unraveling the cast off end and frogging the 3 inches and casting off again. But this is bottom up. How do you even unravel the cast on edge? 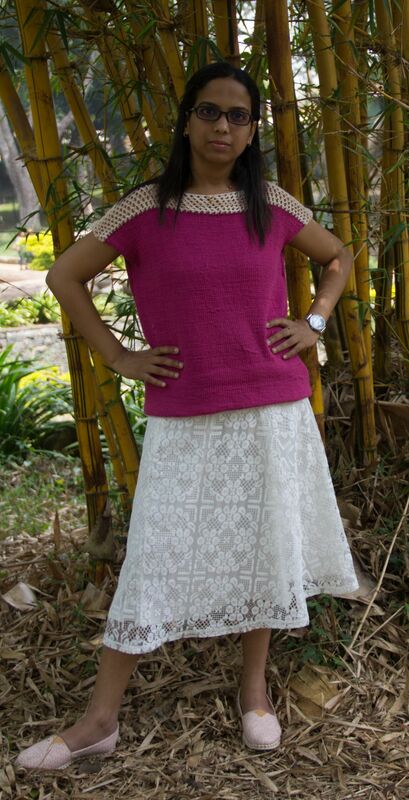 I did some quick fixing here too, since I had planned to wear this for my holiday at Yercaud the next day. I folded the extra fabric underneath and stitched it shut using the same yarn. This actually worked well since the thick fabric edge kept the tee in place. I can’t live with this for sure, so need to figure out a way to fix the length. Next time I hear my voice say “bottom up”, I am going to listen to it. I made a lot of mods. Knit this in round to avoid seam, made the neck opening smaller and so on. All details on my Ravelry Project. I had been away from the blogging world for a while now. Knitting world too! Can you believe it has been more than a month since I held knitting needles? .Twitch. I had to take up a certification exam which is essential for my career and considering how much it costs, I sat myself down for a serious study marathon. The last time I studied like this (as they say burning the midnight oil) was for graduation and that was a good decade ago, so I had to get used to this studying concept all over again. I am glad that is done and dusted and I can get back to my regular routine. I initially picked the cheerful Knit Picks Felici in Botany (of, I love those colors), but changed my in the last minute for two reasons. One, I wanted to play it safe by using a not-that-precious yarn for my first attempt and save the Felici for the second pair and two, which is more important, I couldn’t find the Felici for the life of me. (While I was knitting the socks, the mystery of the missing Felici was eating me away, so I did end up finding it). So, I chose Plymoth Yarn Sockotta. This was a gift from Rima, an SACer, so it made sense to use it for a SAC Along. The first sock flew off my needles and to beat the notorious second sock syndrome, I cast on for the second sock as soon as I grafted the toe on the first one. The second one took its own sweet time and waited for me patiently to graft its toe shut, which, you will not believe, took me a whole month to get done. This was the time my studies peaked and every time I saw this poor little sock with its mouth wide open, I felt a pang of guilt, but exam was of higher priority. And finally when I did get it stitched up was on the last day of the Sock-Along. Huh. So, here is the pair of sock modeled by happy, little feet who were too happy to wear handmade socks. Next up, he wants socks with a Mickey Mouse motif on it. My husband has been very supportive of my knitting hobby. He takes pleasure in being involved with my knitting in any way he can. He helps me winds yarn, comments on my knitting, gives his opinion when I can’t take decisions and in general is very appreciative of my hobby. 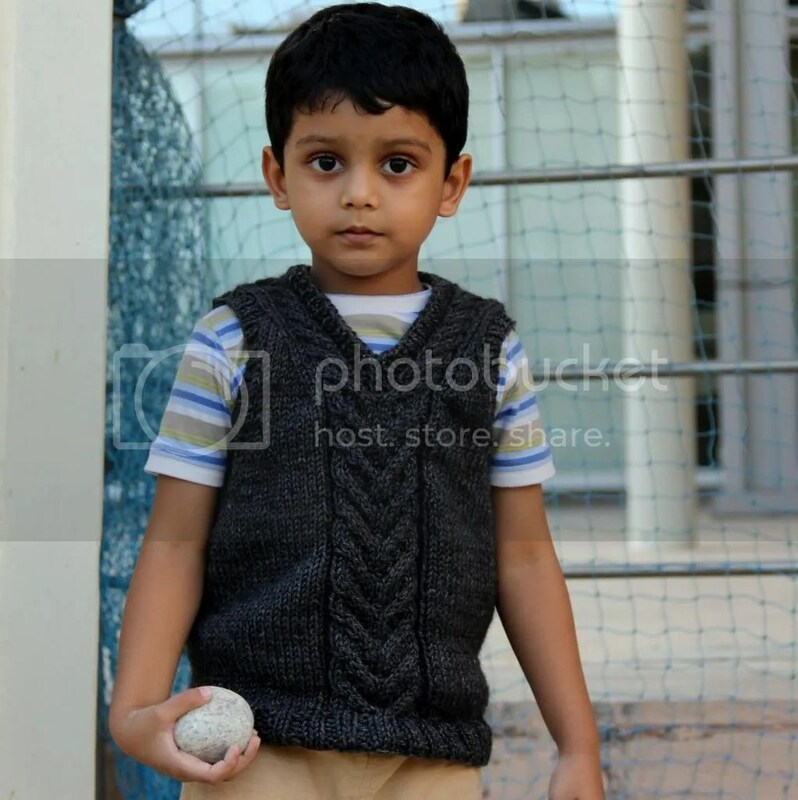 When such a sweet guy requests you for a hand knit sweater, you don’t make him wait for 3 years, do you? Which is exactly what I did. 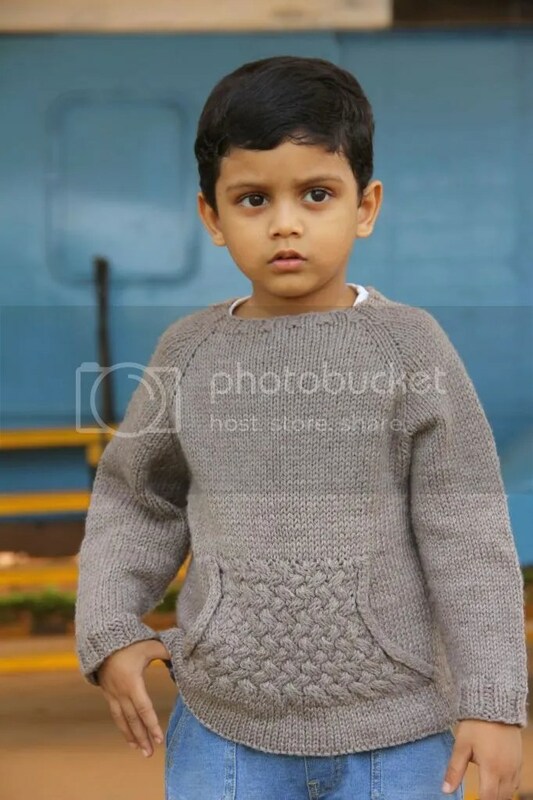 Every year, his birthday whooshes by and I drown in my own guilt and vow to finish his sweater by his next birthday, only for it pass whooshing by without a completed sweater in my hand. I decided to take the bull by its horns and start working on it at the beginning of the year itself so that I have a good 11 months to knit this sweater. Thus was born The Husband’s Sweater Project. After going over the Ravelry pattern database, I decided to make up my own pattern. Husband wants a plain pullover (cables would be nice, but I am bored of knitting cables), so I decided to make a basic top-down raglan. I love top-down because one can try them as you go and raglan is easy to calculate (for me). I am planning a positive ease of 2-3 inches, so I am aiming for a finished measurement of 35-36 inches. I made a swatch and got the gauge: 17 sts x 21 rows = 4″, post blocked. Now that I had all the numbers I need, I opened up a spreadsheet and fed these numbers in. After entering the standard raglan calculations, I ended up with these numbers. This should give me a sweater with 16″ neck opening, 35.5″ chest and 9.8″ armhole depth. Next step is casting on. Stay tuned as I blog about my journey which I call The Husband’s Sweater Project. 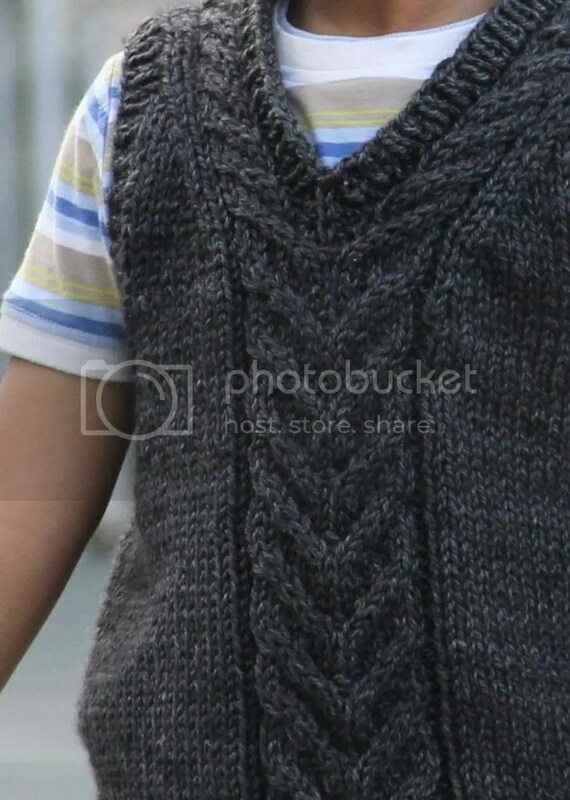 Dyvest is a unisex vest with an attractive cable stitch pattern down the front. The Y-shaped staghorn cable divides into a similar half-staghorn stitch on either side of the V-neck, hence the name Dyvest. Ravelry Pattern: Dyvest by Anjali M.
The staghorn and half-staghorn are simple to knit with just 3 rows of cable and plain wrong side rows. Both cables are charted and written instructions are also provided. 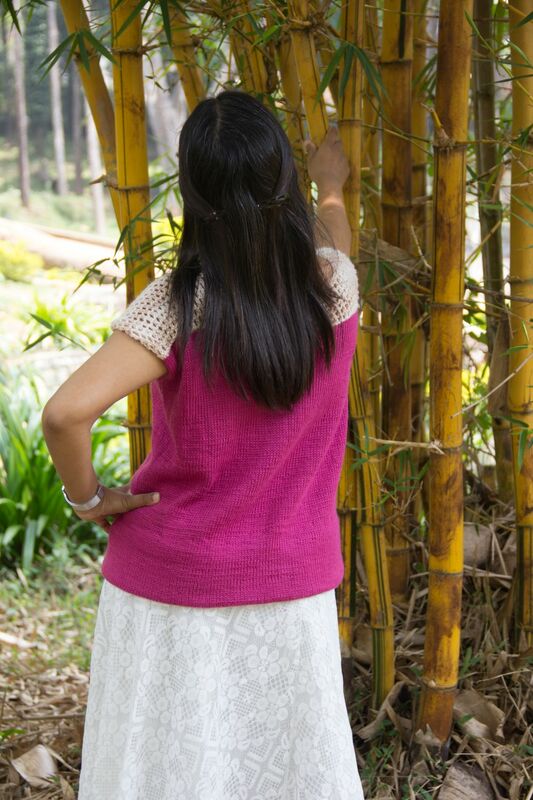 The vest is knit bottom-up in round until the armholes and then the fronts and back are knit flat. The shoulders are joined using three needle bind-off. Armbands and neckbands are knit after picking up stitches. Vest is intended to be worn with 1-2″ of positive ease. I knit the prototype using Bessie May Nettle, which is a blend of wool and plant fiber. This is the first time I worked with a plant fiber and I was blown away by the stitch definition – the cables are neat and crisp. I had to work on the fronts a dozen times, so I can vouch for ‘froggability’ of the yarn too, boys is it sturdy. With the main color as dark grey and the light grey heather, Coal colorway is an excellent choice for men’s and boys’ knits. 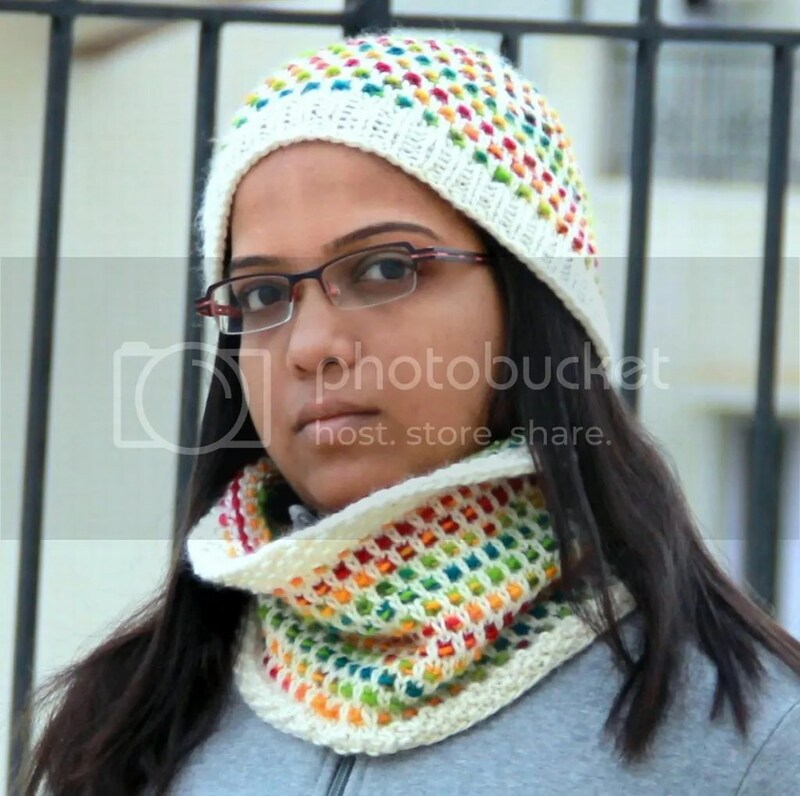 I am very happy to announce the release of Punto Cowl & Hat patterns which are released as part of Malabrigo Quickies. From Malabrigo Yarns website: Quickies are small, fast projects which require only one or two skeins of yarn. 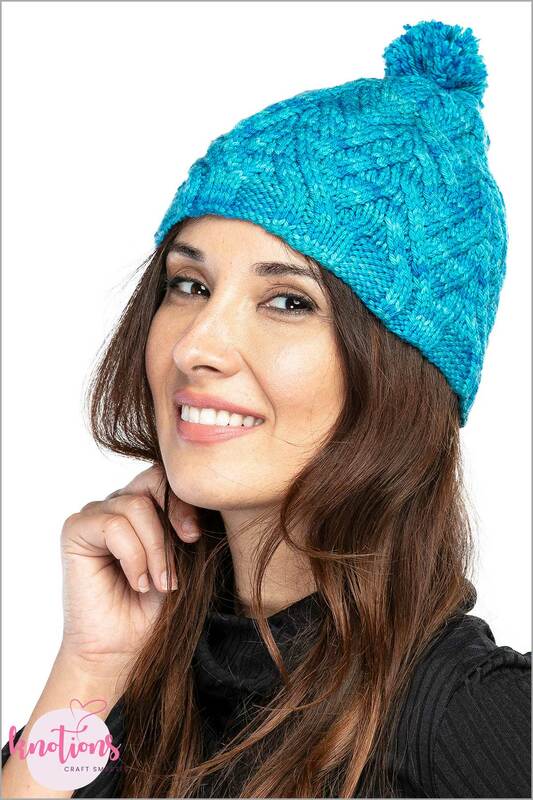 You could knit a small cowl and a hat in one skein each of MC and CC yarn. These patterns can be bought individually or as an ebook. While I love variegated yarns, I don’t like how muddy they look when used with cables or lace. I am not a big fan of pooling in stockinette stitch either, so the obvious step was to pair it with a plain yarn and make something colorful with it. Punto stitch pattern (as I would like to call it) is knit with one yarn per row (no carrying the other yarn) and the colorful CC yarn shows up as little specks or dots against the MC yarn. Punto Cowl comes in 3 sizes. Small: 20 inches wide, a snug fit around your neck, Medium: 28 inches wide, a loose, comfortable fit around your neck and Long: 44 inches wide, where the cowl can be worn doubled up. All sizes are 8 inches high. 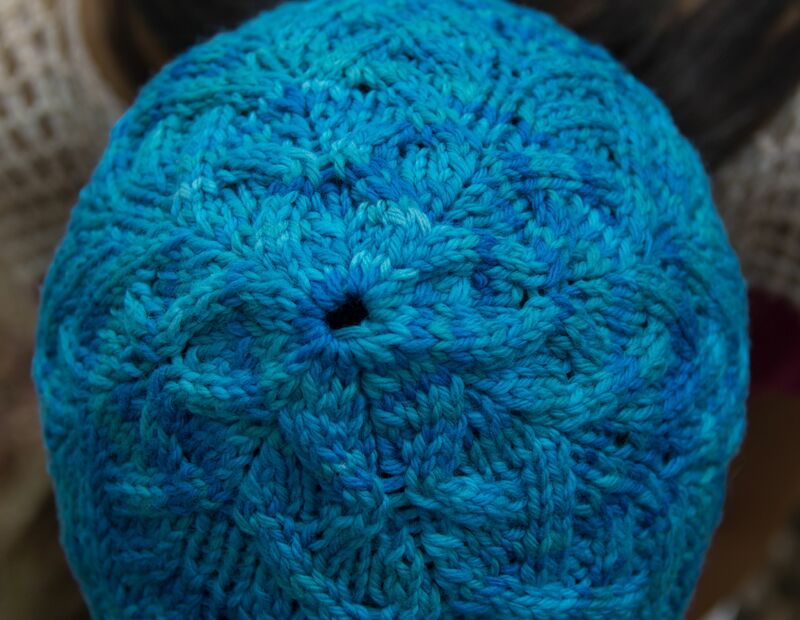 Width and height can be easily modified by working more repeats of the stitch pattern. 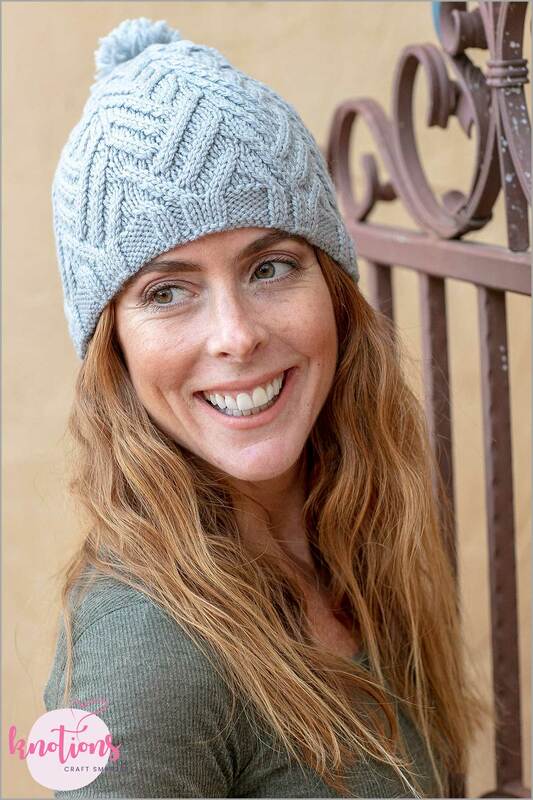 Punto Hat comes in 4 sizes. S [M, L, XL]: 18 [20, 22, 24] inches. These are the finished sizes. Choose the size which give you no ease or an inch of negative ease. Texo (Latin word Texo for ‘weave, twine together’) is a take on the traditional crewneck pullover with a cabled pouch added for extra warmth for the hands. The cabled pouch adds interest and texture to the otherwise plain pullover. The i-cord edges on the pouch give it a neat finishing touch. The top-down seamless construction makes this an ideal pullover to try it on as you go and also to modify the body and sleeves length. Ravelry Pattern: Texo Pullover by Anjali M.